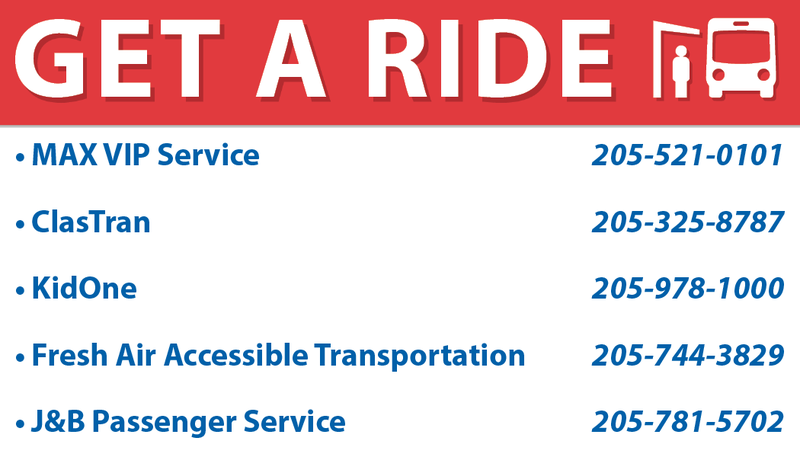 Quick access to local transportation options. If a member is having difficulty with their transportation they should first try to contact their provider to discuss the situation. Encourage them to become a member of their committee or attend their town hall meetings to be a proponent of change. If they are still having difficulty and would like to file a complaint they should contact the Federal Transit Administration Office of Civil Rights at http://www.fta.dot.gov/civil_rights.html or file an ADA compliance complaint at http://www.ada.gov/complaint/. Fixed and para-transit in the greater Birmingham area. Both of these sites provide information on their accessibility and follow the ADA guidelines. On the Max site you can search routes or call a customer service agent to help you find the best route for you. They provide both fixed and para-transit routes and both routes offer accessible buses. 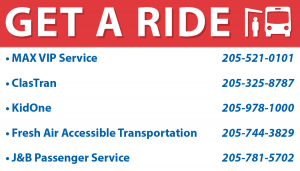 They also offer a very clear 6 step guide on how to get a ride https://www.bjcta.org/riding-on-max/the-six-steps/. ClasTran strictly provides curb to curb demand response services in a shared ride format. You must contact them to arrange a ride and pickup. ClasTran also offers subscription trips that only have to be scheduled once, but happen on a reoccurring basis.